This week is all about a mom, Cora, and her eight pups. 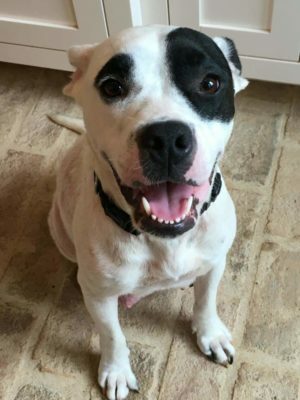 Cora is a Bull Dog/ Terrier Mix that was surrendered by her owner. She had a swollen bite mark on the right side of her face and her previous owner stated that he could no longer take care of her. Cora was pregnant, full of hookworms, and had Demodex, a common infestation of the dog’s skin with tiny, cigar-shaped, eight-legged mites. The good news is that both of these issues have been treated and cleared! Cora loves people and is demanding of attention, but she was being deprived. Even with her puppies around, she is a very loving dog, especially once she gets to know you. Cora was in Baldwin County Animal Control, in Alabama, while she was very pregnant. Several people pulled together to find her a rescue with Doggone Happy Animal Rescue in Harrington, Delaware. 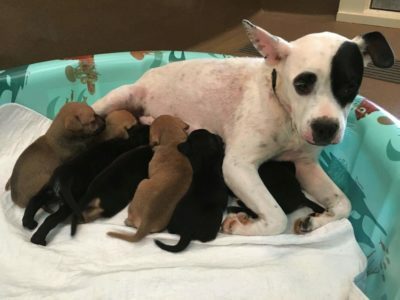 Cora had her puppies just hours before they released her at the shelter, and has been in foster for four weeks now. This Saturday, Cora and her babies are going to their rescue, with the help of all of the volunteer drivers. When Cora arrived at the foster, she would not drink any water, leaving her puppies dehydrated. Her foster put homemade chicken broth and stewed chicken in her food, with a lot of canned food, which did the trick. The puppies were born on May 5, 2016, making them almost a month old. 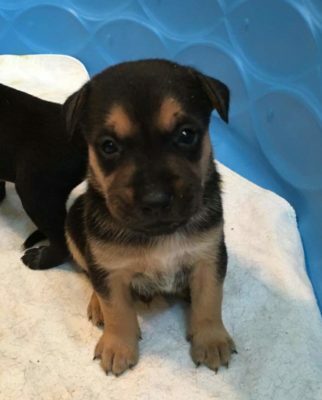 Three of them are light brown with dark noses, two puppies are dark brown with silky fur, two are black with skunk bellies and one is dark brown with tan markings. This makes up for three girls and five boys. All puppies have started eating wet food and drinking water on their own. This is a big transport on Saturday with Cora and her eight puppies! They will be traveling from Greensboro, Georgia to Harrington, Delaware. Thanks to the efforts of Rescue Transport USA, Cora and her eight puppies will be traveling to their new rescue this weekend. Rescue Transport USA works with Team Dahlonega. This team is the networking team that gets the dogs faces out there for Rescue Transport USA to transport. Team Dahlonega raises the vetting expenses and does all the legwork for getting the dogs ready to travel.